It is believed that Jagannath suffers from a high fever after the Snana-Yatra. During this time, devotees are prevented from seeing Him. After taking special care, the deities gets cured and the famous Ratha-yatra is started. The door to the main Jagannath Temple in Puri is kept shut for the last 7 days before the Rath Yatra festival. Well, can you guess the reason? Apparently, every year, during this time, Lord Jagannath gets high fever due to which “visitors” are not allowed to see him. And, it is this fever that calls for a change and hence, the famous visit to their maternal aunt’s (or Mousi’s) place! After the rituals, as per the mysteries the deities fall ill, supposedly suffering from fever after taking the bath, and would remain on bed for 15 days. In this period, the deities are kept in a special sick room called the ‘Ratan vedi’ inside the temple. The deities stay away from the public view for a period of 15 days. This period is known as ‘Anasara’. During Anasara the deities are offered only fruits and water mixed with cheese and Dasamula medicines to cure from fever and are treated by the Raj Vaidya with specific medicines. So, I want know: how/why did this custom (Jagannath getting fever) come into existence? Is there any story behind it? And how many days are the deities kept for special care? These things many not be fully related to official scriptures but mainly folklore. Temple history etc. The Snana Yatra (Odia: ସ୍ନାନ ଯାତ୍ରା) is a bathing festival celebrated on the Purnima (full moon day) of the Hindu month of Jyeshtha. It is an important festival of the Jagannath devotees. It is the birth day of lord Jagannath.This is the first occasion in the year as per the Hindu calendar, when the deities Jagannath, Balabhadra, Subhadra, Sudarshan, and Madanmohan are brought out from the Jagannath Temple (Puri) and taken in a procession to the Snana Bedi. There they are ceremonially bathed and decorated for a public audience with the devotees. On the day of the Snana Yatra, the deities are bathed with 108 pots, of ritually purified water drawn from the northern well of the temple to the accompaniment of religious incantations. In the evening, at the conclusion of the bathing ritual, Jagannath and Balabhadra are dressed up in elephant headgear representing the God Ganesh. This form of the God is called the 'Gajavesha'. Until amavasya Lord Jagan natha, brother Balabhadra, and sister Subhadra will undergo fever. Next Shukla paksha pratipada they will get well. After this, they will ride their ratha on Shukla Dwitiya. The period of illness is known as "anasara". They will be given special herbs like Dasa-moola and special diet during the illness. Bells, mridangam etc. will be stopped in order to give rest to the lord. Different oils and resins along with musk will be applied to the vigrahas for rejuvenation. No darshan will be allowed in the temple till the shukla pratipada of Ashadha. Some priests will do pooja secretly. On the day of Jyestha Purnima , Dev snana is performed. In this the Lord is taken to a place inside the Jagannath temple known as “Snana Mandap” by performing Pahandi (the swinging motion travel of God from one place to another). He is made to have a bath with 108 vessels of water taken from a specific well. 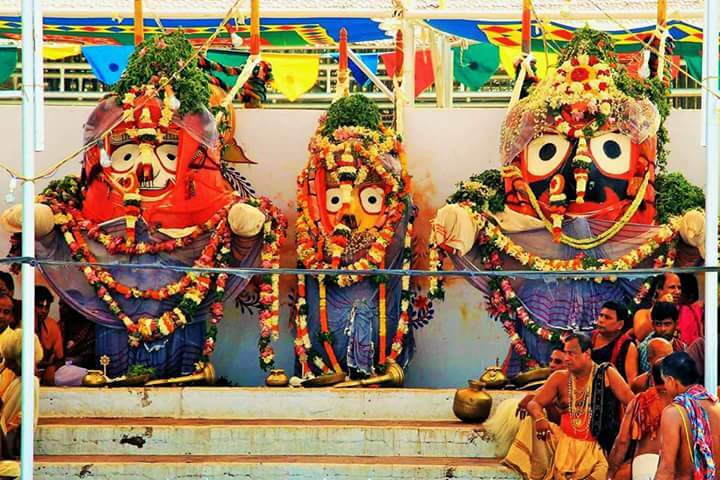 Right after the bath, Lord Jagannath suffers from fever. According to the rituals, the temple is closed for 15 days since he is unwell. These 15 days become a matter of concern for the ardent devotees who want to see him. This period is known as ‘Anabasara’ or ‘Anasara’ in the local language. After this period, people get the first glimpse of their deities on the day before Rath Yatra, on this day the deities are re-painted and brought to the main platform for the devotees to see and pay homage which is called ‘ Nava Yauvana Darshan’. This is also known as ‘Netrotsava’. Next day, the Ratha Yatra Festival is observed. It is believed that during these 15 days the Lord resides in a place about 20-25 km’s away from Puri known as Brahmagiri. 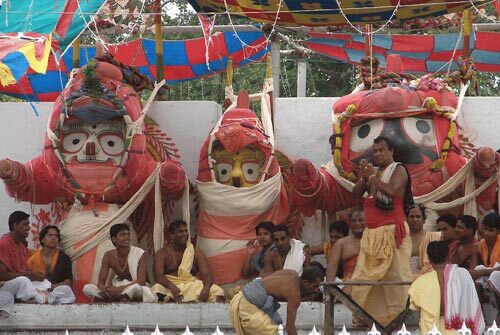 The form of Lord Jagannath worshiped here is known as Alarnath. In these 15 days, authentic food is prepared similarly to Puri Mahabhog. People come in huge numbers to seek the blessing of the God. Not the answer you're looking for? Browse other questions tagged mythology krishna belief temple jagan-natha . Why is the deity and devotee called by the same name 'Swami Ayyappa' in Sabarimala?